these are a few of the best bulletproof vehicles you can buy today. 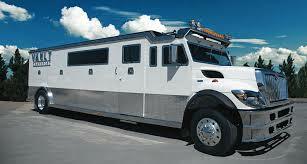 This bulletproof car is like a big limousine because it can carry 25 passengers. Its engine is powered with 245 hp 620 lbft of torque at 400 rpm. This car concurrently affords comfort, safety, luxury and style. Besides protection, there are many facilities of entertainment. It has powerful stereo sound system, LCD display and all mini bar facilities.